The DES-6512 is a 2-port 10Gbps XFP module for the DES-6500 chassis. It uses 10 Gigabit XFP transceivers for uplinking to servers, storage, or department level switches. The DES-6512 is a 2-port 10Gig XFP card for the DES-6500 chassis. 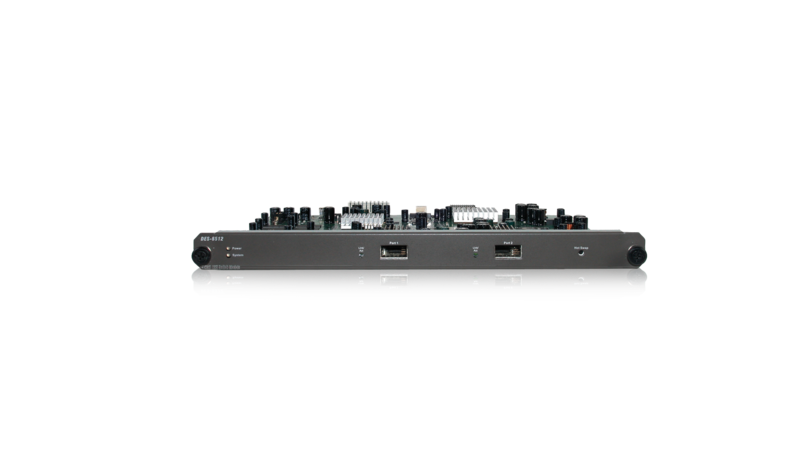 It uses standards-based IEEE 802.3ae 10Gigabit XFP modules to meet the demands of today’s Enterprise and Service Provider networking infrastructure. The DES-6512 is the perfect solution for uplinking to servers, storage, or department level switches such as D-Link’s xStack DXS-3200 series. Fiber media allows for increased distances over copper cabling. When used with D-Link’s DEM-422XT XFP fiber module a total distance of up to 10Km can be reached. This is often necessary when running across larger distances such as campus or multi-building environments. If shorter distances are required, the DEM-421XT module from D-Link provides 10Gigabit Multimode at distances of up to 300 meters.